The perfect combination of size, functionality, and durability. Dual tail-switch interface. Plenty of power and a programmable interface. Fits Streamlight Stinger holsters. A duty light is an essential piece of equipment for law enforcement and security professionals and should always include a handful of features to ensure it will be effective. Probably the most important quality in any duty light is a tactical interface and functionality. A light that uses a tailcap switch allows for one-handed operation, which grants your other hand the freedom to hold your firearm, radio, etc. Momentary activation gives your duty light the ability to emit brief controlled bursts of light for quickly scanning an area or perhaps even as a signal. Having a high-frequency strobe is essential as it is an excellent tool to disorient an attacker or target from a distance, making it an excellent deterrent and self-defense tool. A crenulated bezel can also be an effective self-defense tool and can be used to break glass in the event of an emergency. 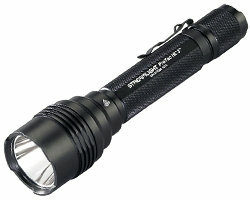 Having all of these features is not necessarily essential, but each makes your torch a more effective duty light. Another essential characteristic of any good duty light is portability. A duty light is a tool you will be continuously carrying on your person and it is imperative that it does not weigh you down or detract from your overall movement. Compact designs are highly favorable for law enforcement and security, who may be on the move for hours at a time and may need the use of their light at any moment. A light measuring roughly 6 inches long and weighing around 8 ounces is small enough to be easily carried without sacrificing power. While this may be our optimal size for a duty light, don't let it stop you from buying a slightly larger model if you feel comfortable carrying it. Additional accessories like pocket clips and holsters are also ideal, giving you the freedom to carry your light on your hip or vest and keeping your hands free for other tasks. While the features above should remain constant no matter where you are using your light, it is important to consider the environment you'll be working in to determine the remaining qualities of your duty light. For instance, security and law enforcement in rural areas may require brighter, farther throwing lights to do their job effectively. This may result in the need for a larger light with a deep reflector to give them the necessary throw. Alternatively, officers and security operating in well lit urban areas or indoors benefit from easy-to-carry lights with wider beams, so compact designs and textured reflectors are preferred. If you are going to be using your light extensively out in the field, you should focus on flashlights with longer runtimes so you're not caught with a dead battery on the job. Factoring in all these conditions will help you fine tune your duty light to your exact needs. While having an effective duty light is certainly the priority, you may not want to limit yourself to a single light when planning your on-duty equipment. Your primary flashlight can get damaged, run out of charge or even get lost out in the field and it is always a good idea to have a backup light in case of emergencies. It's always good to follow the old EDC motto, "Two is one, one is none". This light does not necessarily need to be tactical like the other, but it should be easy to store, whether it be in the glove compartment or your cruiser or in the drawer of your station, so EDC lights are an excellent option. 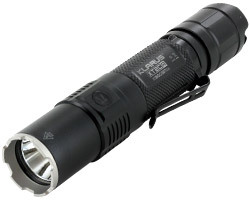 Keylights also make effective backup lights, as they can be easily carried on your person along with your duty light.